"This movie makes you long for the plausibility of a 5'2", basketball-playing werewolf." I have to say, I'm a Jason Bateman fan. As I've said before, I'm a product of the 80's, and I can remember watching him in shows like "Silver Spoons" and "The Hogan Family" and thinking he was the kind of dude I wanted to be like. Funny, with the 'Flock of Seagulls' kind of part in his hair going on. It was a look and persona that I tried to emulate, with limited success. Unfortunately, for both Jason and I, the Bateman mystique wasn't quite as strong as some of his other 80's child star contemporaries. While Bateman had a moderate amount of success with his young career, his Tiger Beat colleagues went on to super-stardom; Ricky Shroder, Kirk Cameron, and, of course, Michael J. Fox. These young men all followed a similar career path, with varying degrees of success. They were all part of ensemble television casts, but they soon became the stars of their respective shows. They then went on to try movies; teenage comedies for the most part, where they were the star. Shroder stayed on the small screen; Cameron made a few light comedies with little success. But Fox hit the honey pot. In 1985 he starred in the time-traveling comedy/adventure hit "Back to the Future". This Robert Zemeckis-written & directed, Steven Spielberg-produced film went on to be a mega-hit, spawned 2 sequels, and launched a fairly successful film career for Michael J., making the impressive transition from child star to working adult actor. But there was another Fox-starring vehicle that came out in 1985. A minor piece of cinema called "Teen Wolf". And while it was nowhere near the hit that "Back to the Future" was, it certainly had its fans (of which, I was one). It was a light, goofy comedy about an unpopular high school kid who comes to find out that he's got some werewolf in the family lineage. Oddly enough, becoming a werewolf causes an upshot in the kid's popularity and, inexplicably, makes him the star of the basketball team. But he soon finds that popularity is no substitute for true friendship and love. The humor was geared towards young teenagers, and that's exactly who went to see this werewolf morality tale. It was a trifling blip in Michael J. Fox's rise to stardom. The point is, even fans of the movie would have to admit that it certainly wasn't "sequel-worthy". There wasn't much left "unanswered" in this insignificant movie. Which brings us back to Mr. Bateman and a little film called "Teen Wolf Too". The urge to rip this movie apart is hindered by 2 things. First, trying to write up a synopsis for this film is not only pointless, but actually physically painful for me to do. In truth, I've already written the description of this movie's plot in the blurb about the first Teen Wolf above. 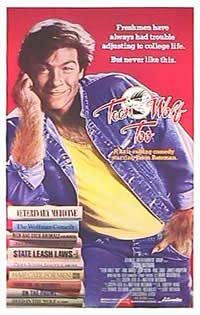 It's not an exaggeration to say that the "writers" for this "movie" simply took "Teen Wolf", changed the setting from high school to college, replaced basketball with boxing, and traded Michael J. for Jason Bateman. The plot points and characters are almost exactly the same as the original. Except that the humor level has been dialed back from "pre-pubescent teenage boy" to, say, "mentally-challenged test chimp". Only the poo-flinging set will find some giggles here. The second impediment to the hating of this movie is the absolute disbelief on my part that anyone involved in this project thought that they were involved in something interesting or worthwhile. The urge to call this movie stupid is constantly interrupted with questions like, "WHAT WERE THEY THINKING?! DID THEY REALLY IMAGINE THEY HAD A HIT ON THEIR HANDS HERE?! WAS RIDING THE IMPOTENT COATTAILS OF TEEN WOLF ACTUALLY BELIEVED TO BE A GOOD IDEA BY MR. BATEMAN AND HIS ADVISORS?!" OK. I feel a little bit better. Needless to say, I did not like this movie. But rather than rehash the entire flick, which I think would be both futile and unpleasant to me personally, I'll just highlight some of the more bewildering sections of this baby. Please note, that some of these points that I bring up could of course be applied to the original "Teen Wolf". My only defense is that Michael J. Fox playing a Globetrotter-esque lycanthrope was better at creating a suspension of disbelief. 1. Why does 'werewolf' equal 'athletic prowess'? I'm just curious how that connection was made. Bateman's character, Todd, goes from band geek to Muhammad Ali with fangs and a horrific amount of body hair just like that. 2. What planet is this movie taking place on where someone turning into a werewolf is met with anything other than abject terror? Outside of some initial gasps of confusion, Todd's metamorphosis is accepted and eventually celebrated by the student body. Is the kid on campus with the unibrow and dandruff like, "Hey! What the hell?! If Wolfboy's acceptable, I should be raking in the chicks!" 3. There was a very specific point in this movie where the disbelief ended and the hating began. After both Todd and his peers come to accept him becoming a hirsute creature of the night with almost neck-breaking speed, we come to the ubiquitous college beer blast. What follows is one of the most insipid musical numbers in the history of cinema! It begins with Todd-wolf singing "Do You Love Me" by The Contours. This obvious attempt to leech off the popularity of "Dirty Dancing" which was released earlier in '87 and featured this song prominently only made me despise the filmmakers even more. But this song-and-dance number is only the beginning of what becomes a TEN MINUTE MONTAGE of nearly dialogue-less Todd-wolf hi-jinks! Todd-wolf catching frisbees in his mouth. NO WAY I was sitting through the credits to find out. I wasn't exactly an Oingo Boingo fan back then. Hell, it could BE Oingo Boingo for all I know). The point is, the music definitely didn't ADD to my enjoyment of this poor excuse for padding. 4. The wolf-changing make-up. It's a staple of any werewolf movie. Needless to say, the "Special" FX are brutal here. It's Regular Todd, Todd sweating with fangs, pointy ears, long nails and a bladder of some sort pulsing on his forehead, and then Todd in full, fuzzy wolf regalia. Maybe they spent the make-up budget securing the rights to Oingo Boingo's Greatest Hits, I dunno. . . .
5. There are a billion other things that I could mention that annoyed me about this movie, but this one stuck in my mind. Todd comes to the inevitable conclusion that his wolf-persona is a jerk, so he seeks advice from his "Uncle Harold" (James Hampton, who played Michael J. Fox's dad in the original movie. He's one of two holdovers from the first film, the other being Mark "Chubby" Holton. Chubby is fat so, you know, it's hilarious... sigh...). Todd decides that he's going to face the 3-time state boxing champion as himself, without his wolf-powers, so he wants some pointers from his Uncle. With a knowing wink and nudge, Uncle Harold tells Todd that, "he just might have a few old tricks up his sleeve that he can teach him; maybe something they haven't seen in the last 30 years...", and they fade to black, leaving us to assume that Uncle Harold's gotta be showing Todd some REALLY wacky stuff that's sure to come to light during the "Big Final Fight" finale. And so the fight is upon us and, as you'd expect, Todd's getting the crap beaten out of him. His evil opponent knocks him down for the umpteenth time during the final round. Todd struggles to get up, looking into the crowd in a daze. He sees Uncle Harold! Thank God! Uncle Harold gives the "secret sign" and a wink! "Remember what I taught ya! ", he seems to be saying. Todd gives a nod back as he struggles to his feet. This is gonna be good, right?! Right?! Todd hits his opponent really hard about a dozen times and that's it. Fight's over. Todd wins. Roll Credits. God, I hated this movie. I'll give you one guess regarding the boxing action in this movie. Top-notch, right? The only good things I can say is, besides Chubby (yes, Chubby is on the boxing team... sigh...), everyone else looks to be in passable fighting shape. And they all seem to be wearing realistic boxing gear: gloves, trunks, headgear. They're fighting in an actual boxing ring, so that's a plus. And it appears that some of the punches thrown were actually connecting, meaning that there's at least a slim possibility that the person on the receiving end might have felt some pain. It's of small consolation, but it did keep this from a "1 count". When all's said and done, I'm still a Jason Bateman fan. I'm glad to see that he's experiencing a bit of a renaissance with appearances in big budget comedies like "Starsky and Hutch" and "Dodgeball". And I saw that he even won a "Best Actor" Golden Globe for the admittedly funny sitcom "Arrested Development". Good for you Jason. I guess I, like Jason, have to put "Teen Wolf Too" behind me. I wonder if Oingo Boingo is still touring. I should go see them. . . .